Even with the cold temperatures last night and this morning, I couldn't resist heading outside early to capture the first sunrise of 2013. 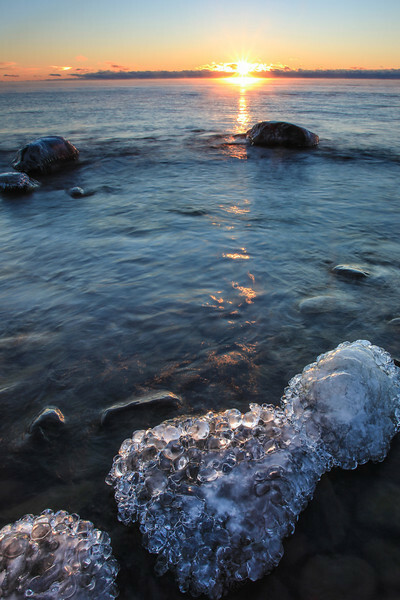 I found a spot along the shoreline with very intriguing ice formations atop the rocks and waited for the sun to make its appearance. Hope everyone had a great New Year's Eve and I wish you all the best in 2013! 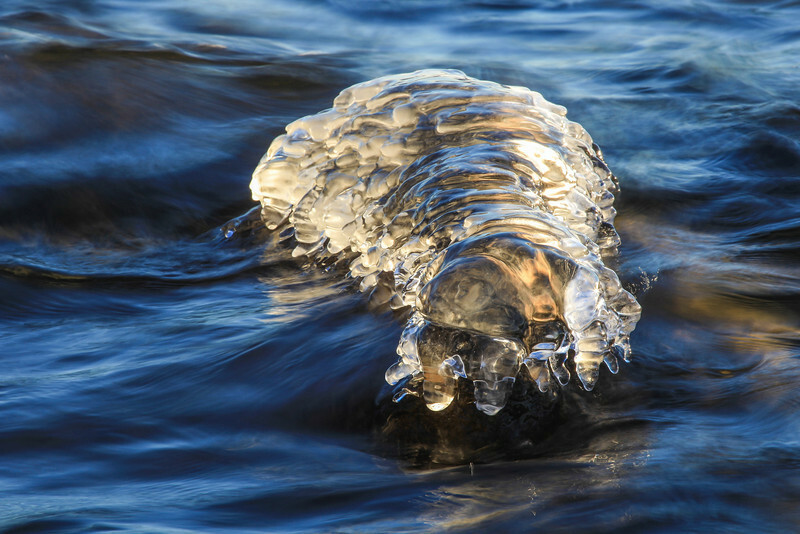 "The Ice Monster of Lake Superior"
This piece of ice was sitting atop a partially submerged rock about 100 feet away from where the "Lake Superior Ice Ornaments" photo that I posted yesterday was taken. To me it resembles some sort of odd creature or monster, sort of a cross between a walrus and a centipede (if you can imagine such a creature!). To my eye the ice hanging down along the sides conjures images of a centipede's legs, and on the part of the ice closest to the bottom of the frame, the two pieces of ice hanging down resemble walrus tusks. "January Sunset over Whitecaps Bay"
Last night's sunset was pretty amazing. Easily the best one that I've photographed so far this winter. I get done with work at 4:00 on Thursdays so I really had to move to get to my planned spot in time, but I did make it and it was worth the dash. I stayed at this location until about 45 minutes after the sun went down and had a lot of fun photographing the changing light, colors and waves. An added bonus was seeing some fox tracks in the snow going along the rocks in the foreground. If you look closely you can see some of the tracks in the lower right corner of the frame. 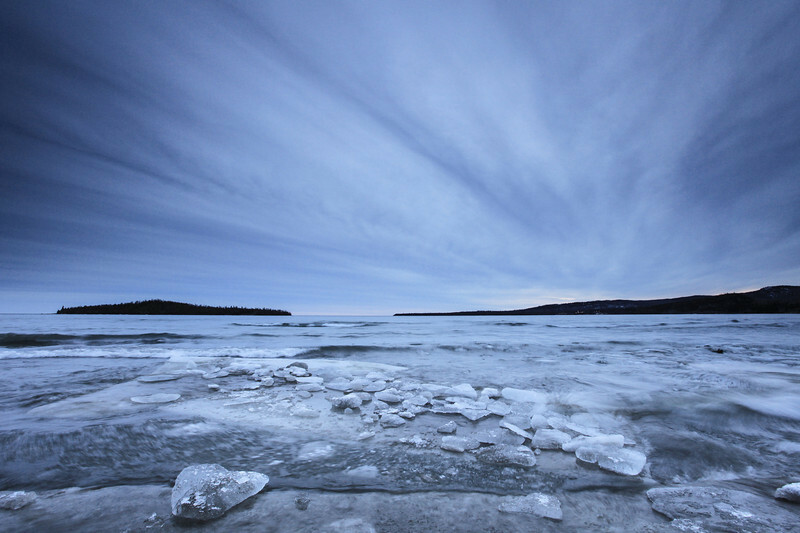 Here is a recent shot taken at dusk looking east along the Lake Superior shoreline in Grand Portage. It was a wind-stricken shore with big waves on this particular evening of January 3rd, 2013. The lines in the foreground ice are what really caught my eye here, but I think the frothy waves in the background add a lot to the image as well. Enjoy! A dog team finds its rhythm after blasting out of the starting gate at the first-ever Gichigami Express Sled Dog Race in Grand Portage, MN. This is my favorite shot from this morning. I got plenty of cool shots of the dogs lunging forward at the starting line, but this one I think tells more of a story. The starting line is chaos; with dogs barking, mushers and handlers scrambling to keep things in order, and spectators everywhere. A couple hundred yards down the trail the chaos of the starting line is nowhere to be found. 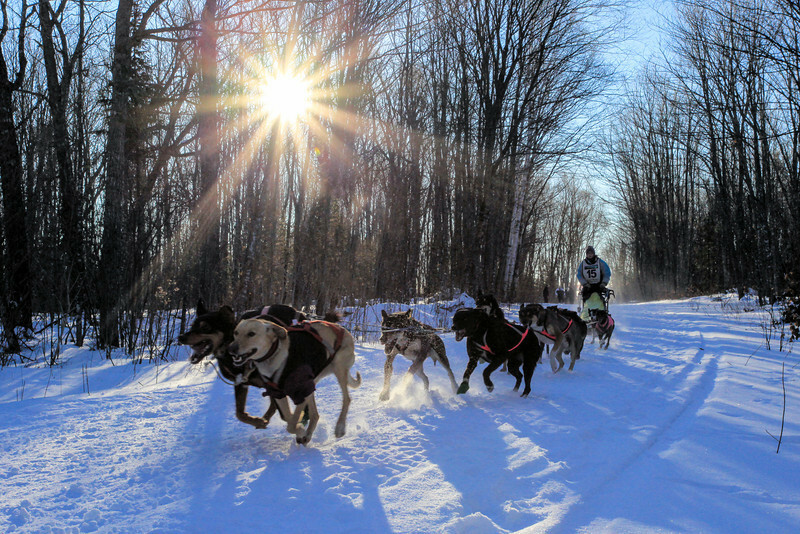 All you hear is the rhythm of the dogs breathing and the sound of the sled as it glides by on the surface of the snow. It is a wonderful thing to witness! 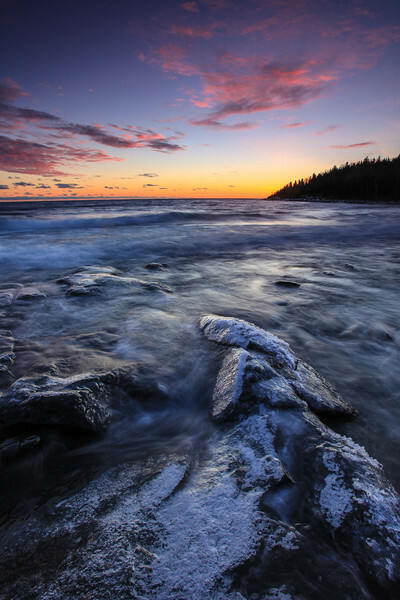 Here's a recent sunset shot from Grand Portage. This was taken a few days ago, one of the best sunsets of this winter so far. Most of our sunsets this winter have been met with very cloudy skies but this one had a few patchy clouds, just enough to really help accent the sunset color. The temperature was relatively mild when I made this shot, but the wind was really strong off the lake, elevating the wind chill and making this shot a bit of a challenge. Even with my gloves on, my fingers had a good chill after shooting this blustery winter sunset. "The Pigeon River: Winter in the High Falls Gorge"
"Snow Angels on the Pigeon River Ice"
During my hike yesterday at Grand Portage State Park I came across this interesting discovery on the river ice... snow angels! 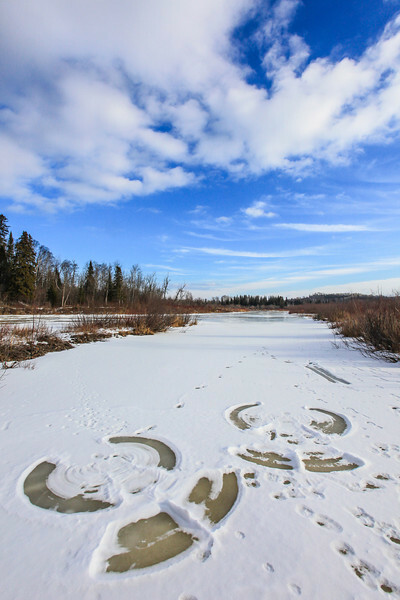 Apparently some park visitors thought it would be the perfect location to plop down on the ice and make some angels. I, for one, am glad they did as I thought it made for an interesting shot! "Winter Afternoon on Picnic Point"
On Wednesday of this week Jessica and I took a day trip into Ontario to do a little afternoon hiking and to spend the evening at the movies. 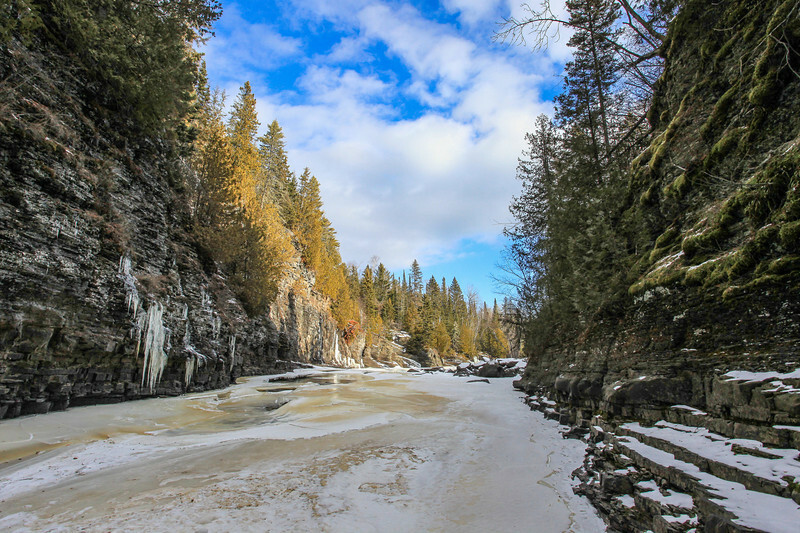 We hiked to High Falls on the Pigeon River via the trail at Pigeon River Provincial Park then went a little further up the road and hiked down to Picnic Point, a fantastic spot on the Lake Superior shoreline. The Canadian shoreline is very different from the Minnesota shoreline. For the most part the Minnesota shore is straight with relatively few islands and bays. Once you cross the border into Canada, however, the shoreline takes on a totally different character. The islands and bays are plentiful, and both can be huge. This view is looking east towards Thunder Bay with Pie Island sitting on the horizon behind the sunlit island, and Thompson Island running down the horizon along the right side of the photo. Our timing to this location couldn't have been better... when we arrived at the tip of the point the little island in the bay (not sure if it has a name) was bathed in sunlight. We found several fascinating pieces of ice along this shoreline as well. It was a great spot to spend some time on a mild (the temp was in the mid 30's) January afternoon. "Grand Portage Bay Ice Dreamscape"
The clouds over the bay in front of my house the other night were surreal to say the least. Sometimes you just don't need color in the sunset to have a compelling image. This photo was made at the usual sunset time, but because of the heavy cloud cover the sky was a mix of blue and gray. 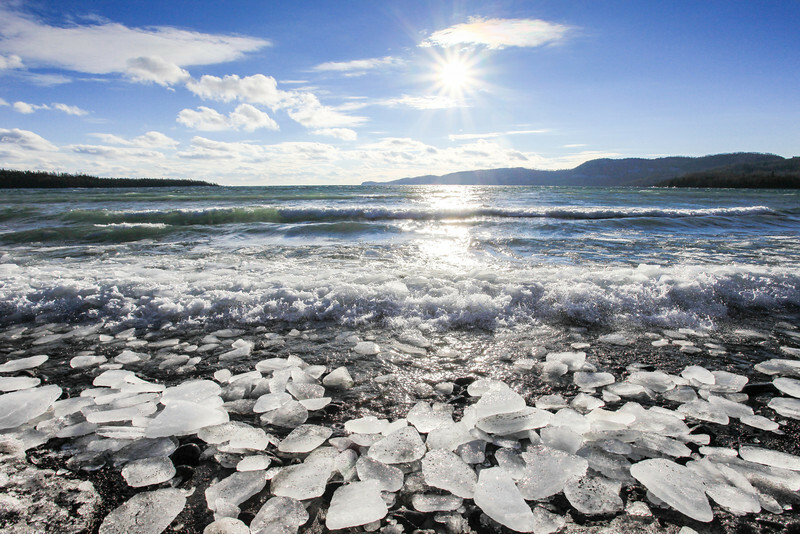 I walked down to the beach in front of my house and found lots of ice chunks floating around in the waves. If you look closely at this photo you'll see that the small ice chunks are actually floating on a larger sheet of ice that was rocking around in the waves. It was a lot of fun to watch the ice rolling with the motion of the lake. 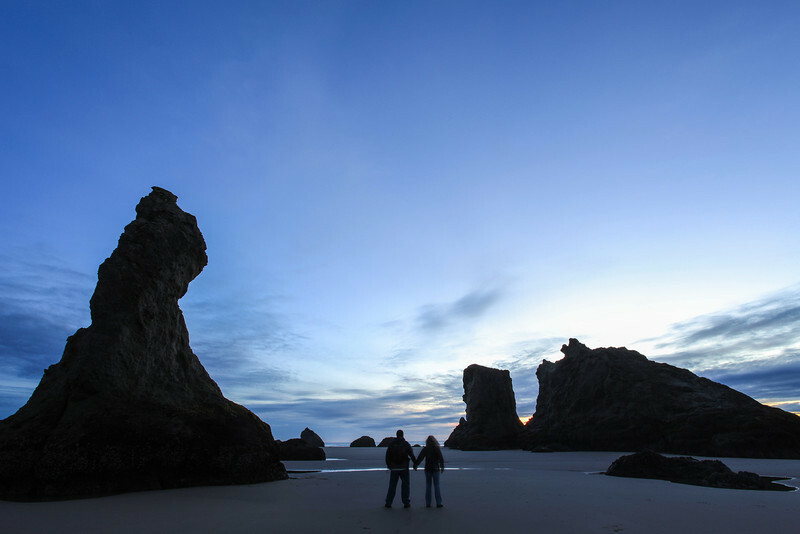 "Enjoying the blue hour at Bandon Beach"
A shot of Jessica and I from our November trip out west. We had spent the day sightseeing and been in and out of rain all day long. As we drew near Bandon Beach just before sunset the clouds started to clear and it looked like sunset was going to be nice. And indeed it was! The sky lit up with glorious colors as the sun dipped below the horizon. We had a blast watching the changing sky and finding star fish and other sea life clinging to the sea stacks. After the sunset color faded from the sky we headed further down the beach to get closer to some of the sea stacks. From a distance they don't look very big but when you get close, WOW are they huge! I just had to get a shot of us posed in between these towering formations. It was a great end to a fun-filled day! 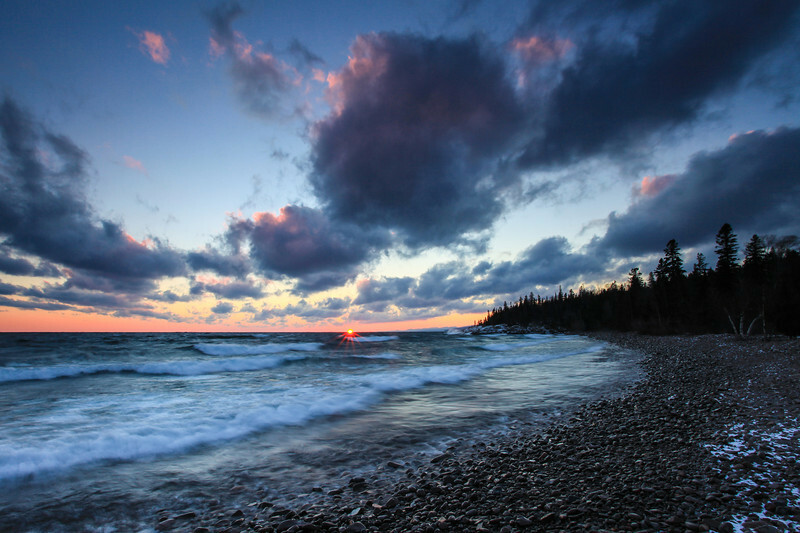 This evening I headed in to Grand Marais to photograph the sunset. The clouds looked good in Grand Portage so I was hoping they would stay nice until I got to GM. Indeed they did and not only that, but the wind was INSANE. I got VERY cold shooting this evening, even though the air temp was a relatively balmy (for January) 26 degrees. I also had a difficult time keeping my lens dry. The wind was so strong and the waves were so big that spray from the waves was constantly blowing around in the air and landing on my camera. I had to try and wipe the lens off between each shot that I took. Every now and then, a particularly big wave would hit the rocky point where I was shooting and would wash right over the top of the rocks, making a temporary waterfall. I was lucky enough to capture one such wave and waterfall, but unfortunately my lens and ND filter had already gotten wet again and as a result there were several light flares on the image caused by the water droplets. I cleaned out the flares as best I could using Lightroom, but some of them are still there. I don't think they necessarily detract from the image, however. 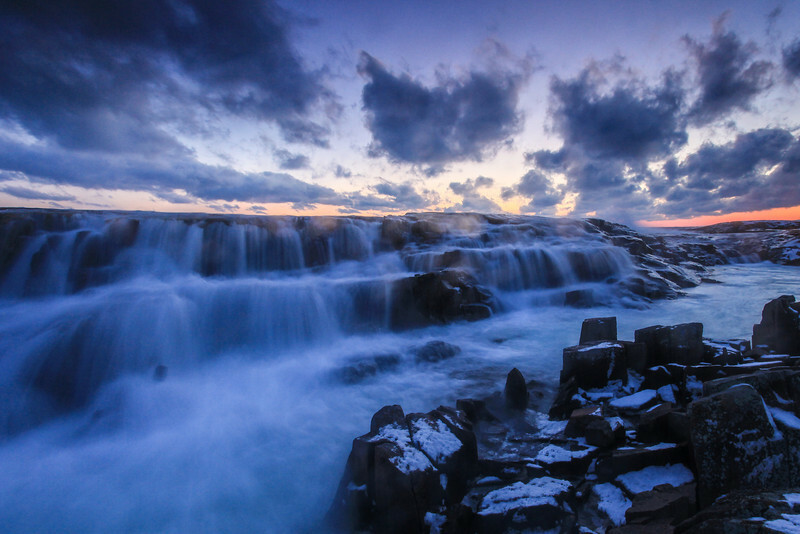 So, enjoy this photo of a rarely seen waterfall right along the shoreline of Lake Superior! This is the result of last night's high winds and waves. The blowing spray from the waves froze onto these shrubs along the Grand Marais harbor. It wasn't a very big area that was covered in ice like this, but nonetheless I had a blast photographing there. 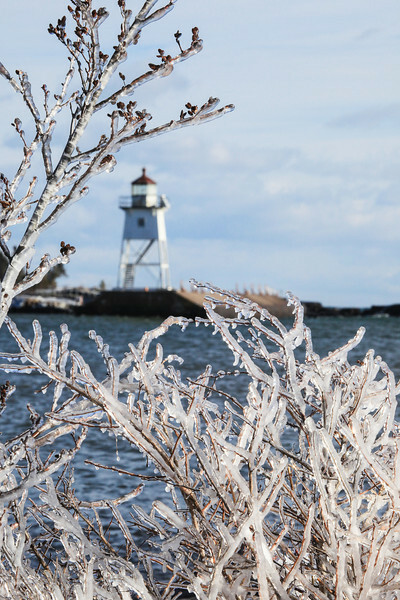 I tried several different angles to compose the ice around the lighthouse, this was my favorite. Captured with my Canon 100-400mm lens. 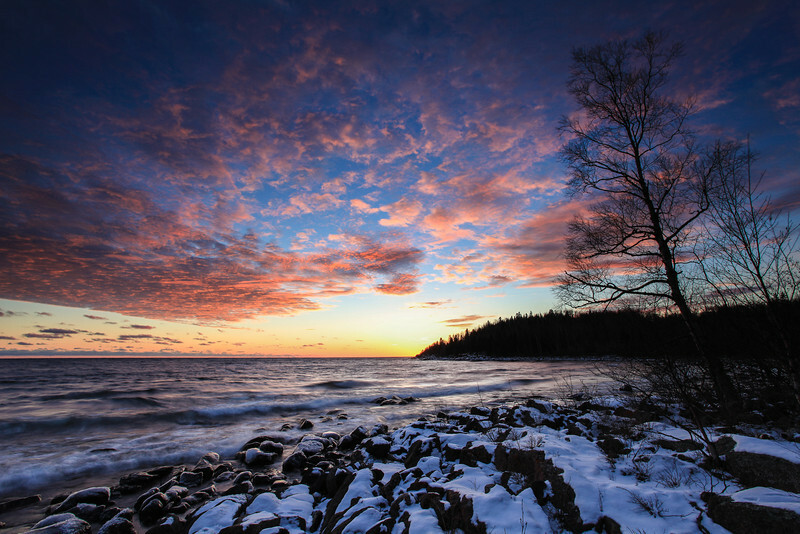 "Sundown - Grand Marais, Minnesota"
Here is another shot from last night's EXTREMELY windy sunset in Grand Marais. This was the very first shot that I made when arriving at this beach. I got there just in time to see the sun for a few seconds as it was dropping out of sight below the horizon. The waves were awesome and I don't think I've ever seen the clouds moving so quickly before. I spent another 30 to 40 minutes taking pictures here after this initial shot. My favorite of the evening was "Superior Waterfall" which I posted yesterday, but I also like this one and wanted to share it as well. 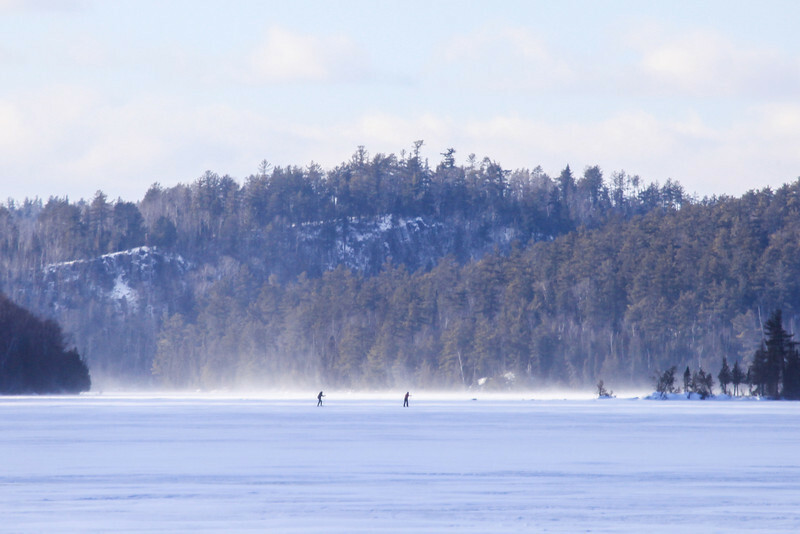 "Skiers crossing West Bearskin Lake"
I spent yesterday afternoon along the Gunflint Trail in Northeast Minnesota, and it was a chilly and blustery winter day. I was hoping to catch a glimpse of a Moose cow and calf that have been seen hanging around the mid-trail area. I did not see the Moose, but I did get a lot of other shots that I like. As I drove past West Bearskin Lake on Clearwater Road I noticed two skiers in the distance, crossing the lake. The wind was kicking up the snow behind them. It looked like a miserably cold lake crossing, which I thought made for an interesting picture. Here's a photo from a couple of days ago, before the weather turned cold. 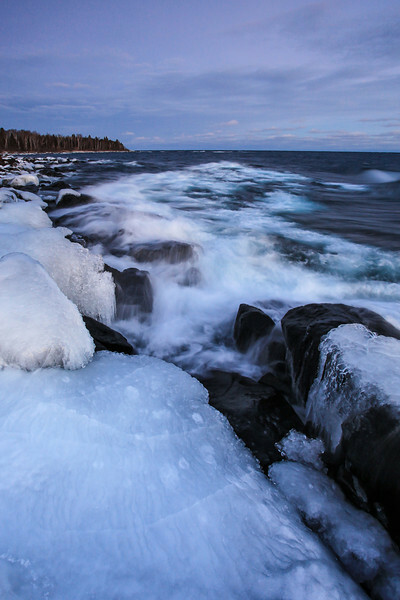 We took a walk through the woods and along the shoreline in Grand Portage and found this beach that was covered in ice chunks both on the beach and rolling around in the waves. Even though this winter has not been up to snuff in terms of snowfall and major ice build-up, I have still been finding lots of fun ice to photograph. Today the sky is gray and it is snowing, so enjoy this photo from a sunshiney day! Here's an abstract ice shot from earlier this week. I found this piece of ice along the shoreline of the Grand Marais harbor, then held it up against the sky and took a picture of it. The overall size of the ice from left to right was about 18 inches. 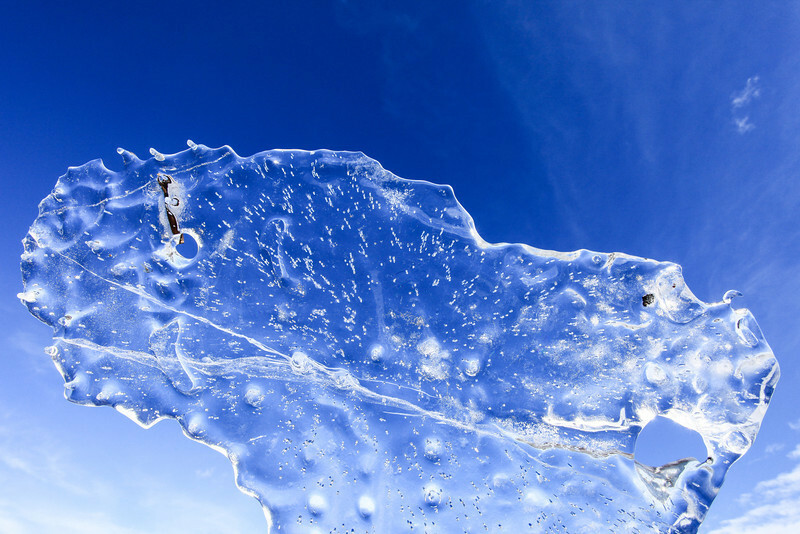 Ice is fascinating and I never tire of photographing it! 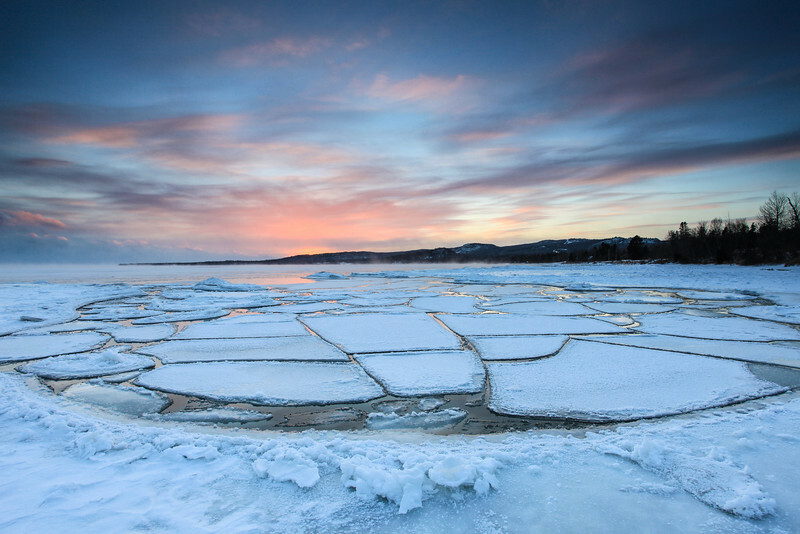 Here's last night's bitter cold sunset right out in front of our house on Grand Portage Bay. This little circular "cove" has been forming in the ice over the past several days. Up until yesterday morning it was just water in the cove, it hadn't yet filled with ice. After 24 hours of temperatures well below zero, the cove was suddenly filled with sheets of ice commonly referred to as "pancake ice". I thought I would name this little temporary ice cove "Pancake Cove". Last night at sunset these were separate sheets of ice, but this morning after another night of temps approaching 20 below zero, these cakes are now almost completely frozen solid. 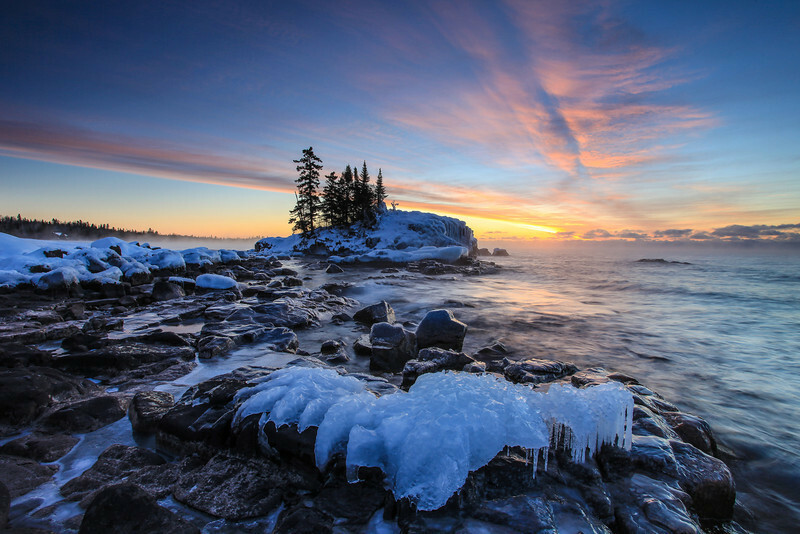 That's one of the things I love most about winter on Lake Superior... things change every day and often look completely different just from one sunset to the following sunrise! 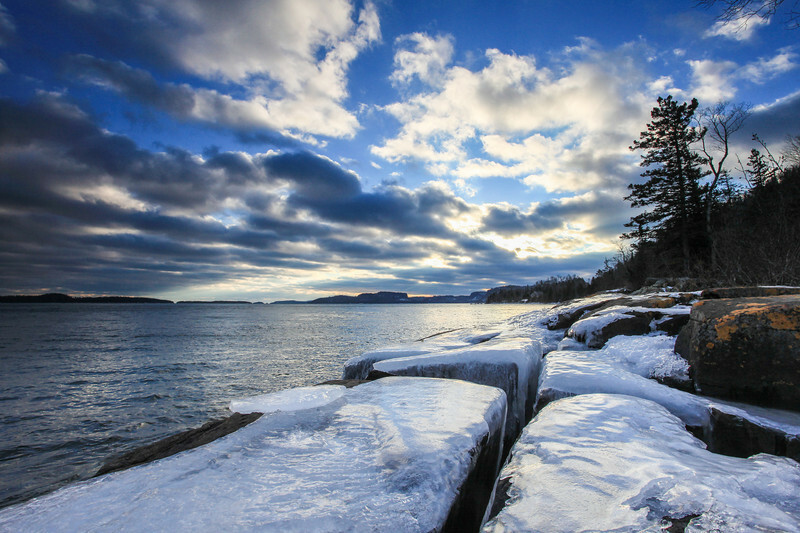 With the bitter cold temperatures of recent days comes the increased production of ice along the shores of Lake Superior! 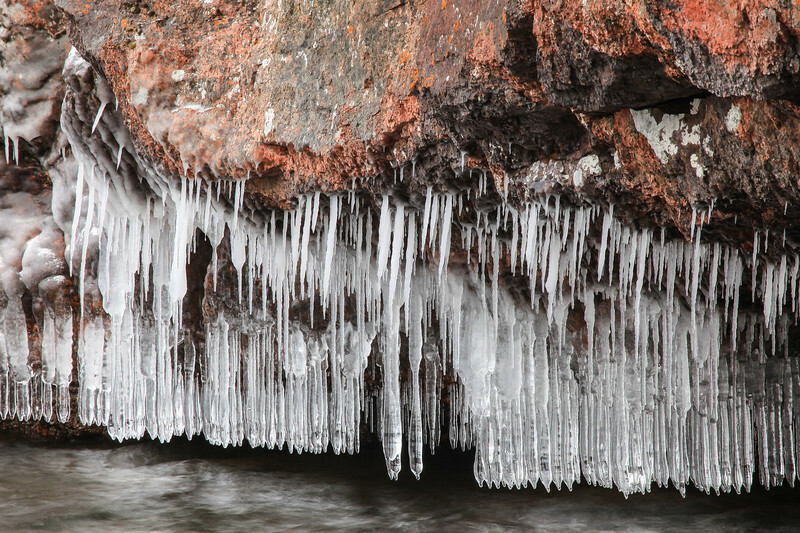 Here's a recent shot of icicles hanging from the cliffs on Red Rock Beach in Grand Portage. 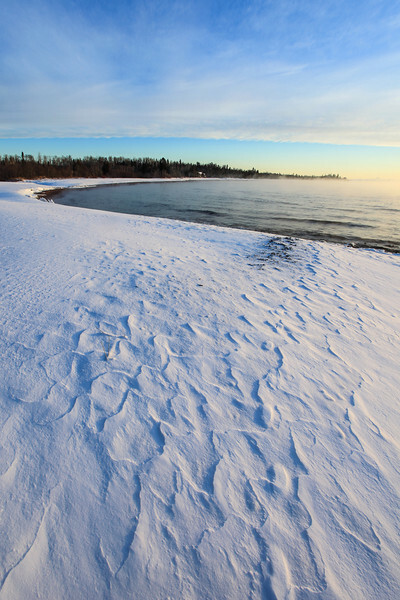 "Winter Afternoon on Mink Bay"
A recent winter afternoon along the Lake Superior shoreline in Ontario. We had really nice clouds all afternoon and the sun kept shooting rays of light down between the clouds. I really liked the cracks in the rocks shown here, and how they draw your eye into the scene. Last night we had a beautiful winter snow storm that dumped 6 to 8 inches of light, fluffy snow on us. 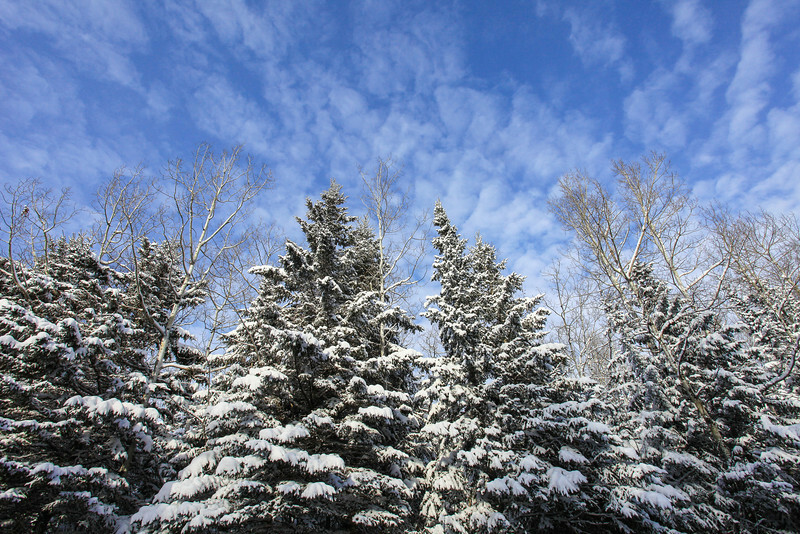 Before I went to work this morning I took a short drive up Old Highway 61 in Grand Portage and was treated to gorgeous views of trees blanketed in fresh snow. To top it off, there were nice clouds above the trees too! Sure feels nice to have winter (in terms of snowfall) finally arrive! 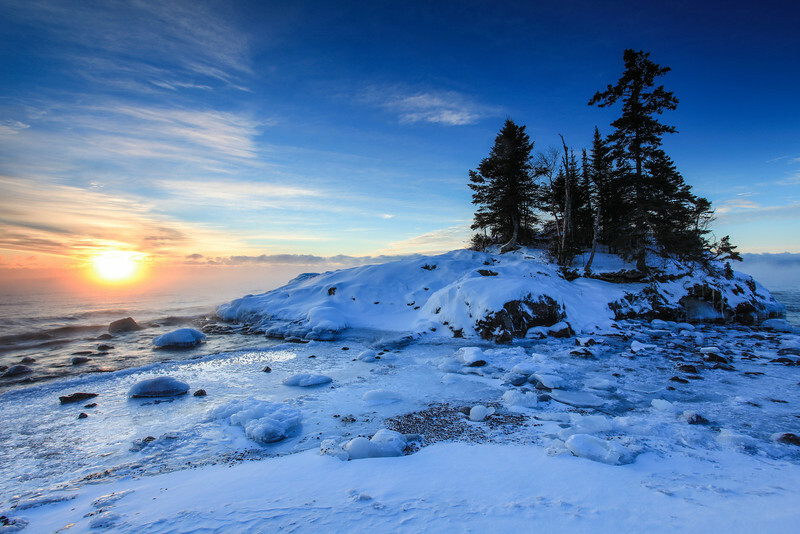 I just got back from spending the early morning along my favorite lake in the world... SUPERIOR! It was a chilly morning, but it felt nice compared to the much colder temps we had earlier in the week. Everything cooperated with this morning's shoot: the clouds, the wind, the light, the ice, the sea smoke... it was all good! This is the first time I've photographed sunrise at this location, and I can say with absolute certainty that I will be going there again for sunrise. It is a wonderful location to shoot the sunrise, especially this time of year. 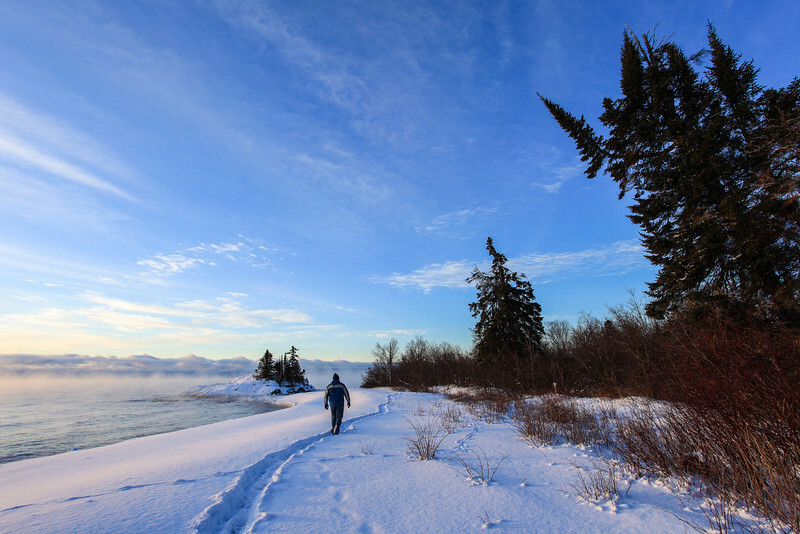 "Winter Walk on the Superior Hiking Trail"
Self-portrait of myself walking down the "lakewalk" section of the Superior Hiking Trail just north of Grand Marais, MN. This was taken yesterday morning, one of the best (photographically speaking) winter mornings that I've ever spent on the shores of the big lake. The lighting conditions were sublime and I came away from the morning with a lot of photos that I really like! Don't you just love winter! 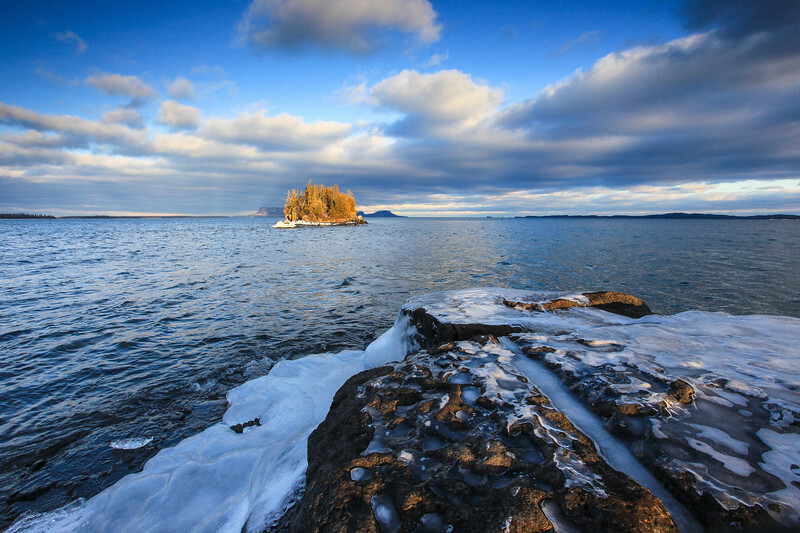 I know I sure do :-) It is my absolute favorite time to photograph Lake Superior! 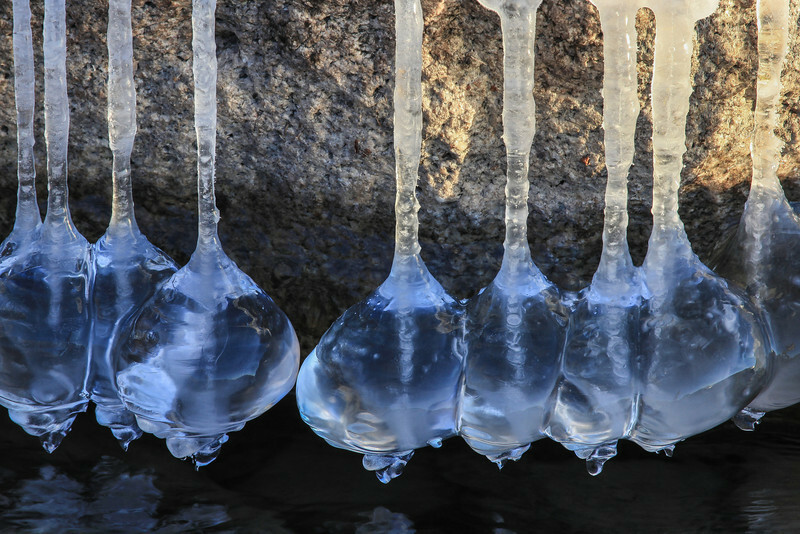 The ice, snow and cold air add atmosphere to an image that simply cannot be matched other times of the year. Yeah, it can be difficult to head out in these conditions, but the results are almost always worth it! I was mesmerized by this scene when I came across it. 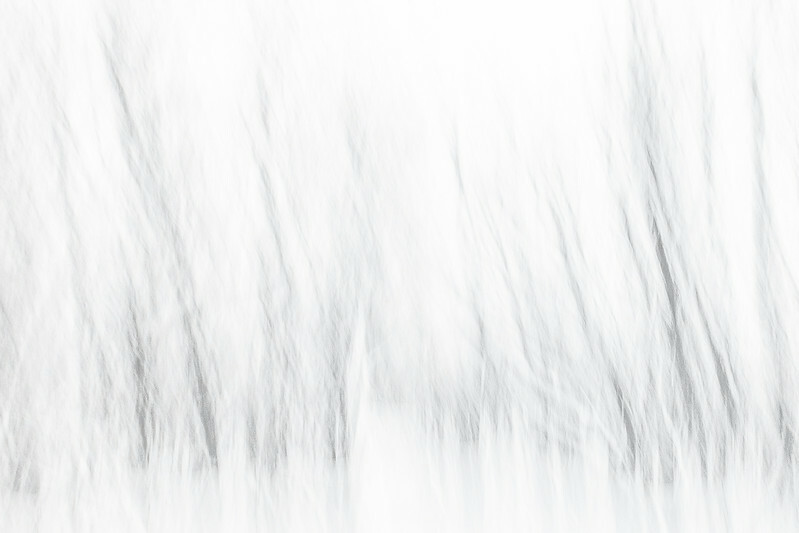 The patterns in the snow created by the wind made for a nice foreground and begged for a vertical composition. The morning light and clouds were the icing on the cake!